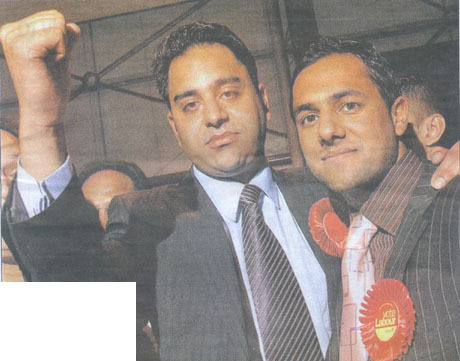 This was the face of victory in Bradford, yesterday, with Imran Hussain bucking the national trend. He won one of the six seats for Labour, making his party the largest in the borough, wresting the crown from the ruling Conservative group. Yet, behind this anomalous result, on a night that brought the Tories 316 seats nationally and control of 11 councils, is a story which the mainstream media have missed, but which the national politicos would be unwise to ignore. Part of that story is the resurgence of the Muslim Labour vote, which had deserted the party in droves over the Iraqi invasion. Three of the Labour victories occurred in wards heavily populated by Muslim communities and, elsewhere in Muslim areas, the Labour vote held firm. But the second part of the story is BNP. Although the headline news had the party losing two seats and gaining one, representing a mediocre result, the detail tells a different story. In all, BNP stood contested 16 of the 30 wards up for grabs and, in addition to winning one of them, came second in nine, third in four seats and fourth in only two. Moreover, in the seats contested by BNP candidates, their share of the vote was 27.5 percent, beating marginally the national share of the Lib-Dems, and beating Labour by a margin of nearly two points. Contrasting the projected national share of the vote for the Tories – at 40 percent - in the wards contested locally by BNP, their overall share struggled to reach 29 percent, less than two points ahead of their right-wing challenger. Labour fared even less well in those wards, taking 27.4 percent of the vote overall – actually less than the BNP, while the Lib-Dims made a mere 20 percent. That, effectively put the party rankings in these wards as Conservatives first, with BNP a strong second, Labour third and the Lib-Dims fourth. Such is the perversity of the first past the post system, though, that the Conservatives gained only five seats, Labour seven, the Lib-Dims three and the BNP only one. It is difficult to estimate the effect the BNP had on the results, but is certainly not the case that, in Bradford, the party was drawing exclusively from Labour. In at least two wards – but probably more – without BNP intervention, seats that went to Labour or Lib-Dim could have gone to the Tories. 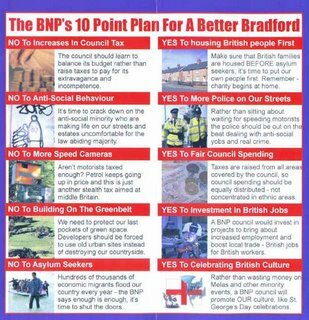 To that extent, the election result represents a "hidden" victory for the BNP and, from some accounts, it is not the only council in which they had an effect. Not least, their leaflet (illustrated) was the best-produced and persuasive of all the parties. Thus, despite being largely ignored by the local media, the party is buoyant and well-prepared for the next electoral contest. The danger for the Boy King and the London-centric media is that the phenomenon seen "oop here" in the North – and the lessons – may escape their attention. For too many of them they get nose-bleeds if they come this far from London. But, like it or not, the BNP are here, and they do not intend to go away.